So when does a sub plot become a novel? When Sherrilyn Kenyon rehashes a lot of plot lines with only a small amount of story added to bump up the page count. Dargonmark (2016. 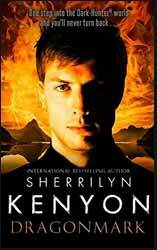 344 pages) is part of the Hunter World series which stands at an astonishing twenty-five novels, Kenyon certainly provides quantity, but from the experience of this novel quality has severely suffered. One of the things that you notice in reading the novel is the paucity of either world building or character development, this is pulp fantasy of the worst, lazy kind aimed at a less discerning young adult audience, which is actually an insult to the YA audience. Given that so much of the story is just a repeat of previous novels I’m guessing that her fan base are going to balk at handing over twenty quid for very little new material, especially as it doesn’t even satisfy the desire to read more about Illarion . Not really sure what constitutes a rip off, but this comes disastrously close.